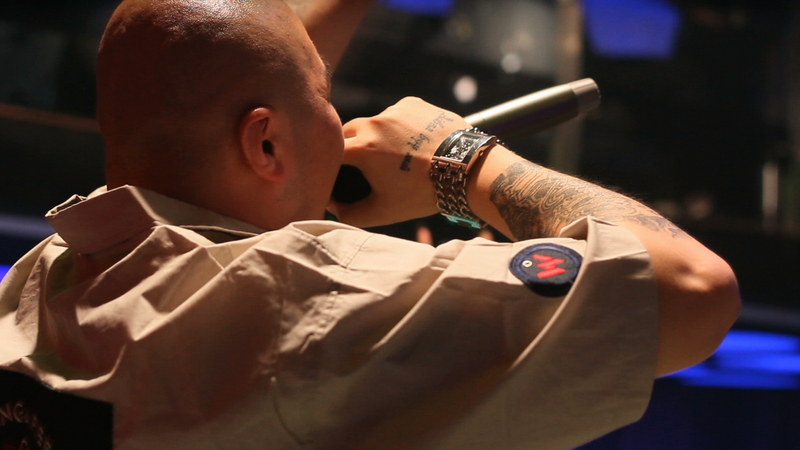 Munkherdene, more commonly known by his stage name, ‘Gee’, is one of Mongolia’s more notorious rappers. His aggressive, vulgar lyrics and commanding presence have helped him make a name for himself. He’s known for rapping about corruption in the government, environmental degradation, the Ger District (where he grew up), and, most notably, his anti-Chinese stance. He’s been featured in articles about a changing Mongolia and is one of three central characters in the new documentary, ‘Mongolian Bling’. Love him or hate him, Gee is one of Mongolia’s most (in)famous rappers. I first met the 28 year-old last November, when I was still getting acquainted with UB’s music scene. I had heard about Gee from Benj Binks, director of ‘Mongolian Bling’, and a few expats who warned me of the violent side Mongolia’s hip-hop scene. But I had yet to hear a track or see a picture when he caught me eye at a concert for pop singer Naran’s CD release. Gee is a large man. He’s well over 6 feet tall and has the bulk to make one second guess engaging him in an argument. He wears baggy pants and oversized sweatshirts with screen-printed Mongolian symbols. There is an ever-present heavy chain around his neck, which holds the large talisman his shaman gave him. His head is shaved down to the skin. Tattoos adorn his hands, arms and even cheek. The tattoos on his right arm pay homage to some of his musical heroes (the Wu-Tang Clan and Tupac), while the tattoos on his hands show his Mongolian side. The proverb split between the two hands reads: ‘Aibal buu khii; Khiibal buu ai’ (translation: ‘If you are scared, don’t do it; If you did it, don’t be scared’). He has the personality to back up such an imposing presence. There’s a boyish arrogance to him that comes of as cocky, yet he has a certain charisma that is sort of endearing. He walks with a swagger and is not shy to exploit his size. During an interview he told me he was the best Mongolian rapper with the most impressive crew, which includes UB’s best graffiti artist, best tattoo artist, and best beat makers. In fact, two members of his noteworthy crew sat silently sipping tea at a table nearby during our hour-long interview. The second time I met Gee, he was performing for a televised music award ceremony. I sat with him, another rapper, and the members from folk rock band Jonon, during the 2 hour-long shoot. There were about ten acts (mostly pop bands who lip-synched to recordings of their recent hits) and two emcee’s who interviewed musicians in between acts. Throughout the show, Gee was almost happy to show his boredom by playing video games on his handheld device or loudly laughing at other performers. After Gee and Jonon played their song, Gee was given the top award (something like ‘Musician of the Year’), which he accepted with palatable disinterest. This is not the way I would ever choose to act at a public event (especially a televised one). Yet, I couldn’t help but feel glad that I was sitting at Gee’s table. Despite his arrogance, or perhaps because of it, I found I was eager to be on his good side. It felt eerily similar to social interactions back in middle school – a period I spent seeking acceptance from people I didn’t actually like. Gee started rapping in 1998, when he was just barely a teenager. He grew up in Ulaanbaatar’s sprawling Ger District (home to about 2/3 of the city’s population). As the son of a single mother in one of the city’s poorer neighborhoods, Gee says that he needed a way to express himself. He first started writing poetry. But, after acquiring a cassette tape of various rappers (Dr. Dre, Snoop Dogg, and The Sugarhill Gang), he thought he’d try and merge his poetry with beats. Gee released his first album, ‘Bolovsrolgui Seheetnii Tavigdahgui Iltgel’ (rough translation: ‘An Uneducated Nobleman’s Unreleased Presentation’) in 2005, but it was his appearance in a 2004 song and video called ‘Hood’, by well-known hip-hop group Vanquish, that started turning heads. ‘Hood’ showcases four rappers (and their crews) who each introduce themselves and rap in turn about their neighborhoods in UB. At the time, Gee was the only person rapping about the Ger District, and his pride in his neighborhood and gangsta style made him stand out among Mongolia’s rappers. But not all of Gee’s songs have a greater message. In our interview, he expressed frustration over the fact that Mongolia’s hip-hop fans mostly like songs about conflicts between rappers. He told me he’s not interested in using his music to fight for superiority with other Mongolian rappers because he’s already the best. Yet, one of Gee’s big hits (86,000 plus views on YouTube), ‘Mongol Rapper’, is 3 minutes and 57 seconds of Gee asserting his rapping superiority over another Mongolian rapper, Tsetse. Gee’s most controversial song is titled ‘Hujaa’, a racial slur referring to Chinese people. It appeared on his most recent album which was a collaborative effort with Jonon called ‘Mongolz’. In it, Gee raps about Mongolian superiority and its future dominance over China. If the lyrics weren’t shocking enough, the corresponding music video certainly will draw your attention. Gee stands in a meat freezer with sheep carcasses dangling from meat hooks all around. He wears a white apron splattered with blood and looks straight into the camera wielding an ax as he sings. It’s creepy, which I’m pretty sure is what he was going for. The song, understandably, turns the foreigners living in Ulaanbaatar and their Mongolian friends off. It reflects and promotes a rising xenophobic nationalism that is having very real effects on some of UB’s foreign population. For years, Chinese and interracial couples have enjoyed a heightened risk of random assault, but now it seems that all foreigners are being targeted. Not a month has gone by since my arrival in UB when I haven’t heard of a foreigner – sometimes a friend – being randomly assaulted because he or she was not Mongolian. But for many Mongolians, ‘Hujaa’ resonates. The past decade has been a time of rapid change and development, which only seems to be increasing in speed. The Economist Intelligence Unit projects that Mongolia will have the second-fastest growing economy of 2012 after Libya. But there is still a question as to whether Mongolia’s development will be beneficial for the majority of the populace or only a select few at the top. The nationalists and many of Gee’s fans feel it is the latter and point to foreign involvement (particularly in the mining sector) as the cause. There’s a prominent belief that foreign interests, especially Chinese, are taking Mongolia’s mineral wealth, destroying the environment, and doing little to invest in Mongolia’s future. In addition to the current political-economy, history plays an important role. Many are quick to point to thousands of years of warfare with and occupation by the Chinese. But what might have left a more lasting impression was the aggressive Soviet-led anti-Chinese propaganda campaign of the 1960s and 1970s as the USSR used Mongolia as a buffer state. As is the case with nationalism and racism in any country, it is most likely a combination of all factors. This might all help explain why, at a recent club opening in Erdenet, the young crowd was calling for Gee to rap his most controversial song. Gee performed five songs that night, and ‘Hujaa’ was by far the most popular. It was also the only one people sang along to. After the show, a reporter I was traveling with asked a pair of 21 year-old fans why they like that song. They explained that it is about being proud of Mongolia, but mentioned nothing about the Chinese. Although the anti-Chinese message is the overpowering one from ‘Mongolz’, Gee and Jonon have more to say about their pride in Mongolia. The song ‘Minii Nutgiig Nadad Uldee’ (rough translation: ‘Leave my Country to Me’) which features veteran Mongolian hip-hop artist Bayaraa, talks about environmental degradation and calls on the government to preserve the land. When he’s not giving interviews to foreign reporters or traveling around Mongolia performing at club openings, Gee is looking toward his next project. He told me that he wants to focus more on gangsta rap, but not 100%. ‘I do whatever I want,’ he says. Loved this post about Gee, the UB rap scene, and Mongolian history!! Thank-you for enlightening me … Great work, Lauren! very good video. nice job, Lauren! Though I understand the oppression of the Mongolians by the Chinese, etc., I disagree with the xenophobic, strong overtones. The sad thing is that right now there’s probably a popular culture trend going on right now in Mongolia that makes more rational voices speak out. I say this as a Canadian who is of Chinese descent and has enjoyed living in a peaceful democracy lke Canada so far where diversity and plurality in our society is respected..and people normally ask for that respect, protest it, but without being violent when it comes to ethnic and racial tensions Otherwise nothing positive gets resolved for future generations. but this post gives good understanding yet.